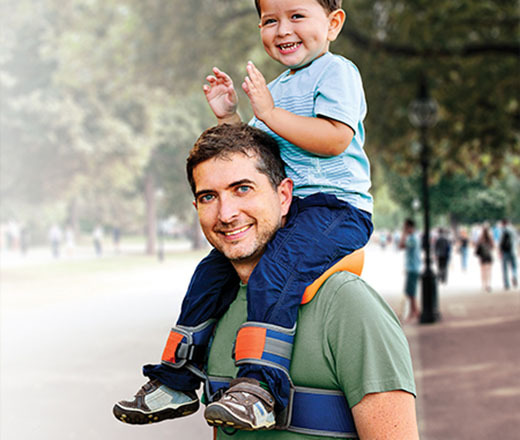 My daughter is just about to hit the age where she'll be able to ride on Dada's shoulders, so this caught my eye: the SaddleBaby claims to make shoulder-riding "a safe & fun way to bond with your child!" And you know, I'm sure it's a smooth ride. But if I have to schlep one more thing to strap to myself, adjust, clip in, tighten, insert tab A into slot B, ad nauseam, I'm gonna lose it. (Not that you weren't lifesavers at times, Bjorn and Ergo!) But this is one parenting activity that I'll be doing the old-fashioned way - if nothing else, the look on that guy's face in the photo has convinced me to steer clear!